Our Chimichurri Spice combines a whole lot of flavors. The almost apricot flavor of aji mirasol chiles, the peppery sweetness of guajillo and New Mexico chiles, and the earthiness of oregano, cumin and bay make an ideal flavor base to make Chimichurri sauce. Just mix it with lots of fresh herbs, citrus, plenty of garlic, vinegar and oil. You’ll have a sassy sauce that begs to be put on…..everything! When used as a marinade, the grill fire tames the acidity of the vinegar, enhances the sweetness of the citrus, and intensifies the heat of the chiles. Use another drizzle of sauce to make any cut of meat, beef especially, perfectly balanced. Chimichurri gives that sweet-tart-spicy-meaty union that screams “summer food” the world over. The flavors of this sauce meld together over time, so keep some in the fridge all summer long. Combine all ingredients in a blender and blend on medium to more finely chop the herbs and break down the garlic. Don't liquefy! You want to finely chop the herbs but still see flecks of green. Pour the marinade into a glass jar with good seal. It will keep for a month or more in the refrigerator...and just keep getting better. Give it a good shake before using. Put the flank steak in a large resealable bag, and add enough of the Chimichurri Sauce to thoroughly coat the steak. Squeeze all of the air out of the bag, and seal. Place bag on a plate and put in the refrigerator. Marinate for at least 2 hours, or overnight. 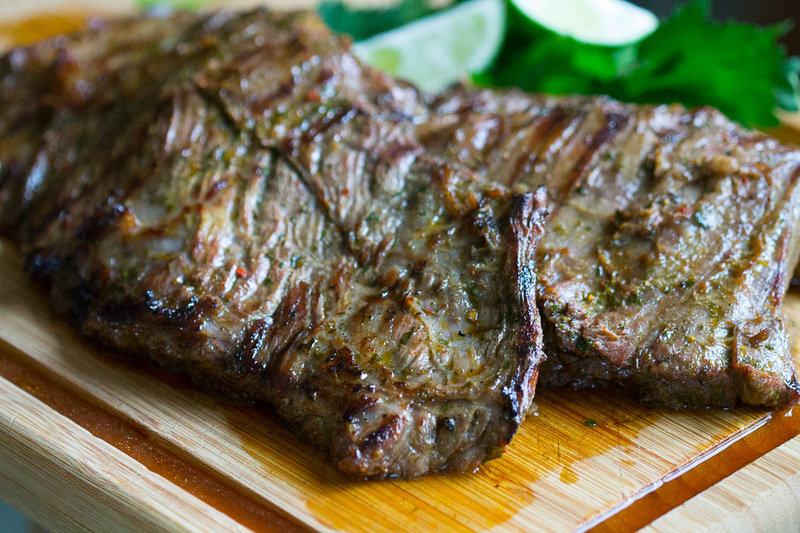 You can either grill or broil this flank steak. When your coals are hot and ready for cooking, take the flank steak out of the bag, but make sure that it still has some of the Chimichurri Sauce coating it when you put it on the grill. Grill or broil it to your desired doneness. When you take it off the grill, allow it to rest for 5 - 10 minutes. Slice the steak against the grain and serve on a bed of rice with a drizzle of Chimichurri sauce over the top and more on the side, along with a lime wedge. You can vary the selection and proportion of herbs in this recipe in so many fun and tasty ways. Increase the herbs for a thicker consistency to use for dipping and topping or play with oregano, marjoram or whatever is fresh in your market or garden. Wow, what a fantastic Christmas dinner! We marinated a Caribou roast over night, wrapped it in bacon (the Caribou is very lean, and the bacon helps to prevent the Caribou from drying out), and roasted in the oven. Yummy! Wow! And WOW! Made this tonight for a former professional Chef! She was impressed! Am going to play with the rest of the Chimichurri slurry (lot’s left over) with chicken! Please try, cause is AMAZING! Next…am going to try Chicken Gumbo as we go into Fall! Thanks World Spice and Silk Road Diary! You are my inspiration and confidence! We love our Chimichurri Sauce recipe, too! It works very well as a marinade for chicken, pork or flank steak, as well as veggies (we did some corn on the cob, zucchini & red onion with it…amazing!!). We’ve also been known to just pour some of the Chimichurri Sauce over rice and eat it. And you’ll love the Chicken Gumbo recipe, too. We got it from a Louisiana boy who had a little coffee shop across from our shop. It gets raves from people, too.) We’ve got more recipes coming, so keep an eye out.